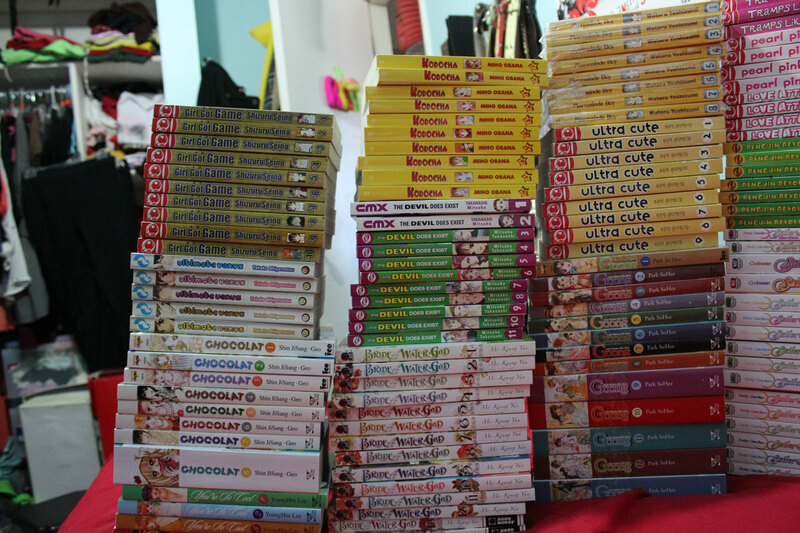 Like I said, I wouldn't post my manga collection unless my wishlist (CLICK!) arrived. Well I don't have Earl and the Fairy, but I pretty much own what I've written on there. So here it is. 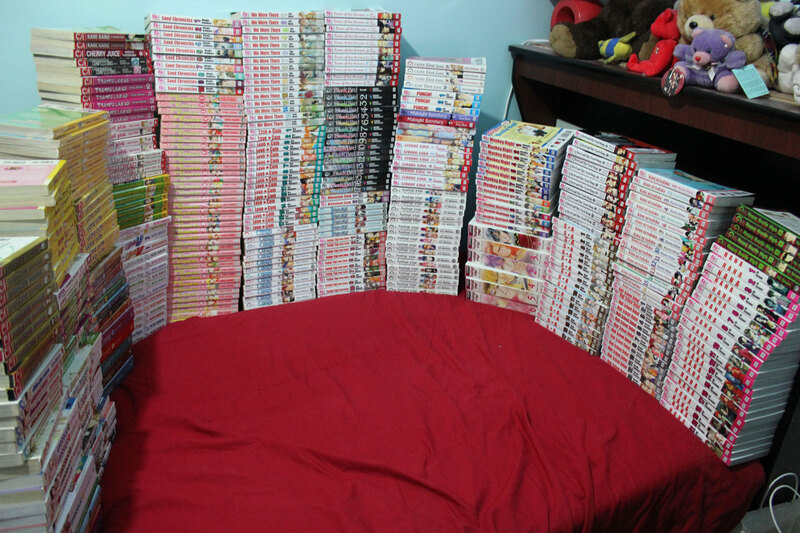 My manga collection in all its glory!!! 418 books and counting. Entirely shoujo! I try as much as possible to collect manga series in complete (granted they’re published complete) , however, the incomplete ones are either still hoping to get them complete, or I’ve lost interest in them..
You're So Cool is my second favourite manhwa next to Goong. It was hilarious and I don't know I just have a soft spot for tough guys whose weakness is falling for a girl who is totally not his style. The Devil Does Exist. I watched the TW drama first before I actually started this series. The drama pretty much followed the manga, but I say, I liked the ending of the manga more. It kind of reminds me of Boys Over Flowers with all its bullying and dark theme, but the good thing about this series is that there are no awful mothers who go great lengths to make sure theirs sons don't end up with a poor girl. Kodocha. Akito and Sana always win me. Hands down. Marmalade Boy. I watched the anime first, and it wasn't until few years later I started reading the series too. Anime was loosely based from the manga. It added more characters and drama whereas the manga was pretty much straight forward. Yep, I liked the manga better. Girl Got Game. One of the funniest manga series ever. Just awesome. It lacked on the romance part since it focuses more on the fun, basketball games, and friendship stuff, but still it was fun to watch Eniwa slowly falls for Aizawa. And oh, I totally prefer this over Hana Kimi. Ultimate Venus. Siiiigh. Could someone pick this series up for publishing again. It left at such cliffhangers, and I wanted to see this end. This series seriously had a lot of potential. Ultra Cute. One of those series I got in my university years. It was cute, but not really something I'd read over and over again. I don't even remember the last time I read it, probably the first time I read the last volume. The Bride of the Water God. Everything about this manhwa is just beautiful. Art and story wise. It was pretty unique. I mean a fake bride sent to marry an angry Water God? Who wouldn't get intrigued. The plot thickens as the story goes, and it gets complicated. Not sure I could even keep up with a lot of new characters popping up though. Still it's a good read. Goong. Need I say more? I super loved it! I can't wait for the day this series is complete on my shelf! Boys Over Flowers. The longest series I have ever collected. Worth every cent. There's something about Tsukushi and Tsukasa's relationship that I'm just sucked in right away. I've seen all different versions of BOF; Taiwanese, Japanese, Korean drama, anime, and manga, and I still don't get tired of this series. Sand Chronicles. A lot of people compared this series to Bokura Ga Ita. MEH. How could you? I seriously do not like this series. The plot would sometimes be ridiculous and I'd often find myself asking, "why were they breaking up again?". And that fiancee thing part was totally out of this world. Like in one volume, Ann met this guy on the train, guy proposed to him a marriage, then guy tore off the marriage license they were about to submit. I'M LIKE WHAT??????? It all happened in ONE VOLUME. 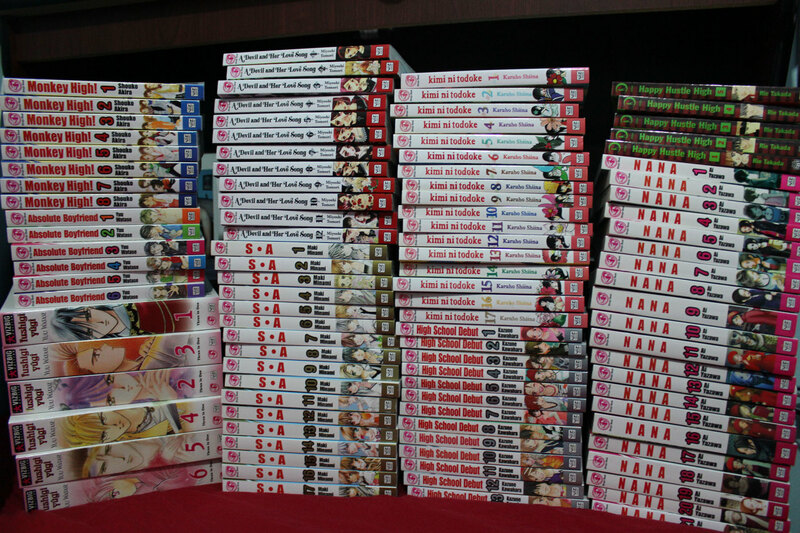 My #1 rule: I do not sell my manga no matter how awful the story is. So yep, I'm stuck keeping it. Black Bird. Another great manga that went down the hill. Honestly. I thought it was way different than Love Monster because Misao was a strong heroine. Well that was at first. 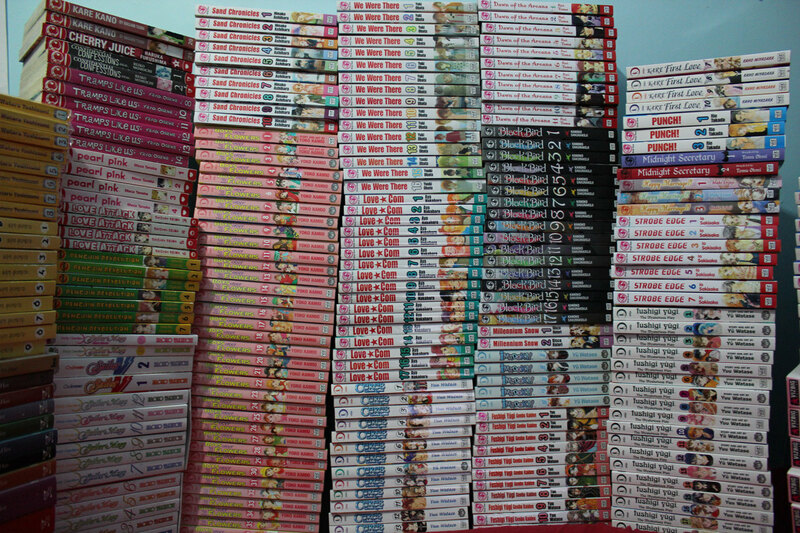 Pity I don't sell manga. I would love to get rid of this series. Tramps like Us. Awesome Josei. Still saving up to complete this series. I loved the ending. Love Attack. I thought I had vol 1 and 2 of this series. But apparently not. weird. And this series need to be picked up too! Love*Com. FUNNIEST MANGA I'VE EVER READ. Can't even remember the last time I've laughed out loud in every volume. Otani and Risa are just adorable. And Otani is so freaking sweet to Risa when they finally decided to go out. I swear, he steals my heart too. Fushigi Yugi. Very first Yuu Watase series I've known. Very classic. TAMAHOME! MIAKA! Fushigi Yugi Geunbu Kaiden. Prequel of FY. This series shows the universe of the four gods before Miaka and Yui discovered it. A lot of people said the series was awesome, but I put it on hold for quite a while, and I regretted it. Never EVER put any Yuu Watase's works on hold to read. The story is very beautiful and the heroine is so strong. It pains me to know what Takiko would become of even before I read the last volume. Millennium Snow. TBH, I liked this series better than Ouran. It was a shame mangaka put this on hold for a decade only to end it in 2 more books. I thought this series had a lot more potential. Kare First Love. Still hoping to get this complete. Wishlist piles up and sadly, this series isn't my top priority. Kare Kano. I don't think I read the entire series. I bought the last two books since I wanted to jump and see the ending. It was too dark and too many characters for me to keep up. Cherry Juice. BLEH. I'm glad I didn't spend money on this, only for one volume. HATED IT. Midnight Secretary. SO GLAD this series is finally licensed. Rare to find strong female in shoujo world these days. Happy Marriage?!. What did I say about convenient marriages? I LOVE THEM. Imadoki. YUU WATASE BOOK? I love. Penguin Revolution. Really recommended. Beautiful art with quite unique plot. I remember it was full of cliffhangers; I needed to read the next volume right away. Confidential Confessions. Too dark for me, so dropped. Ayashi No Ceres. If I didn't love Yuu Watase enough for making FY, then this series would have done it for me. All time favourite series ever. I can't even. Strobe Edge. One of those manga series I didn't think would ever get licensed. I thought this was uber cute. I would love to pocket Ninako. NANA. Another series special in my heart. It breaks my heart knowing I'm still waiting for Yazawa-sensei to finish this. So tragically beautiful. I miss Ren. so much. Fushigi Yugi VizBig Edition. YEP. That's how much I love Yuu Watase. SA. I love strong and smart women in shoujo. They're hard to come by. This manga wins me for that reason. Monkey High. Same as SA. And I loved that Masaru isn't your typical shoujo boyfriend (tall, dark, handsome). Everything about this manga isn't the typical shoujo (we don't even get to dramatic plots, just your slice of life) Must read! Kimi Ni Todoke. Oh Sawako<3. High School Debut. Cute manga, and I think Haruna and Yoh were perfect. But I kinda went down the hill towards the end, especially about that stalkerish girl trying to break Haruna and Yoh to the point Haruna went obese like WTF? Totally ridiculous. cute ending though. A Devil and Her Love Song. I loved the premise. I liked how Maria is very straight forward, and she's adorable in her lovely spin! Happy Hustle High. I have a soft spot for this series since this was my very first completed manga, and at the same time it was really good. I want to pocket Hanabi and her obsession with Pockys! 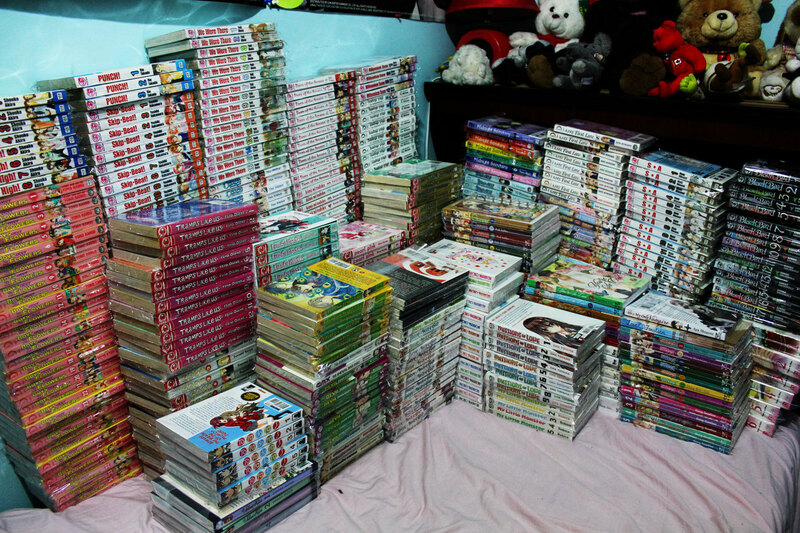 So yep, all my manga! 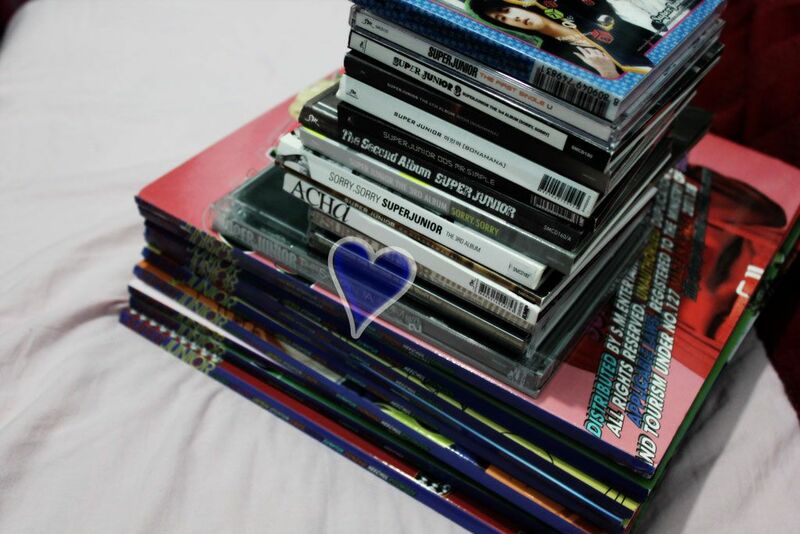 Looking at how much my collection has grown always make me feel so proud and a bit teary. I remember I would save my allowance from parents (which wasn’t much to begin with) to buy manga rather than grab lunch in my university years.